In the backcountry, it’s imperative that you protect yourself from the elements. Whether it’s rain, snow, sleet, or hail, being soaking wet is a surefire way to ruin your experience before it really gets going. To stay dry outdoors, you’ll need to get yourself a rain jacket that can protect you from anything mother nature can throw at you. To help you out, we’ve created this ultimate buyer’s guide to the best rain jackets for hiking. Let’s get to it! If you’ve ever stood outside during a cold rain storm, you understand how quickly you can get chilled in wet and windy conditions. While dancing in the rain might be a fun activity in the front country, where you can run inside for a change of clothes when you get too cold, during a hiking or backpacking trip, being cold and wet can be dangerous. A proper rain jacket is critical when outdoors as it can keep you dry when hiking in the rain or when an afternoon thunderstorm rolls in while you’re at camp. 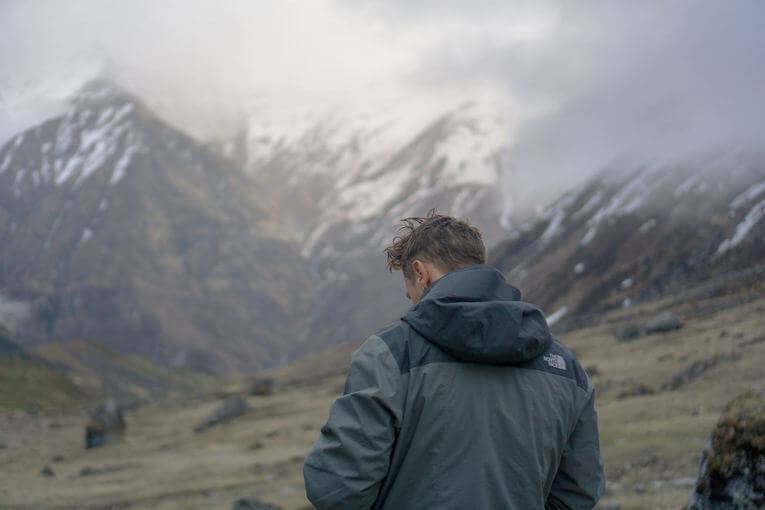 Since there is no one rain jacket that excels in all environments, it’s important to understand the different factors that determine which one might be best for your hiking needs. We put together a list of the best rain jackets that offer a balance of durability, reliability, and affordability. The PreCip is Marmot’s do-anything jacket. A lightweight build with a number of smart design choices makes the PreCip a top contender for hikers who need a rain jacket that is breathable and durable enough for days on the trail. This rain jacket is made with Marmot’s proprietary waterproof membrane, known as the NanoPro, which holds up well in heavy rain. Plus, the PreCip is fully seam-taped so rain can’t soak through the fabric at the natural weak points at the seams. While the PreCip’s construction makes it highly waterproof, Marmot also added some key design features to enhance breathability. Zippers at the armpits can easily be opened for some extra ventilation on the trail. Our main concerns with the PreCip center around its lightweight construction. Whenever weight is prioritized in outdoor gear, there are often some durability concerns, and the PreCip is no exception. The thin shell fabric on the PreCip does save weight, but it can make the wearer feel cold during a heavy rainstorm. Moreover, the finishing touches, like water-resistant zippers, that one normally finds on higher-end rain jackets are notably absent on the PreCip, but this is a sacrifice that one makes for a light and affordable rain jacket like this one. The Watertight II is Columbia Sportswear’s answer to the needs of hikers on a budget. A solid rain jacket for day hikes and backyard adventures, the Watertight II focuses more on affordability and simplicity and less on the bells and whistles typical of a higher price point model. Made with a two-layer Omni-Tech waterproof membrane, the Watertight keeps wearers dry while hiking but isn’t the most breathable option out there. Built with a heavier fabric, but without pit zips the Watertight II tends to trap sweat and moisture inside, so it may not be ideal for people who enjoy highly aerobic activity. That being said, the Watertight II has a nice form-fitting shape, which makes it suitable for use around town. Plus, the soft lining around the chin and brow help keep the jacket comfortable after hours of use. Since it doesn’t have many of the advanced features you’d expect of a higher-end rain jacket, the Watertight II might be best for hikers who enjoy smaller day hikes instead of a long distance thru-hiker. The Watertight II is a potential option for people on a budget, who want value and simplicity over fancy technology. The Venture 2 from The North Face is a rain jacket option for people who want to wear the same shell on the trail and in town. A great value for a weekend warrior, the Venture 2 provides great durability and water resistance without a ridiculous price tag. This rain jacket’s 2.5 layer build and 100% ripstop nylon construction give it some serious durability for such an affordable jacket. Plus, the Venture 2 manages to shed rain and keep hikers dry while allowing for enough stretch and mobility as one moves up the trail. Where this jacket shines, though, is in its ability to keep you dry whether you’re on the trail or in town. If you’re hiking in the hills, the pit zips will help you dump excess heat and moisture, but if you’re in town, the sleek looking fabric will keep the rain away, while also looking good. The Venture 2 does fall short in a couple of areas, however; the jacket’s hood is fairly spartan and doesn’t quite fit over a helmet, which is a concern for climbers and skiers alike. Plus, the Venture 2 is a bit bulky, so it might not be great for ultralight hikers. But, if you want a mix of durability and value, the Venture 2 might be your next best trail companion. Helly Hansen is known for combining style and functionality into their outerwear, and the Seven J is no exception. A highly breathable and fully seam taped rain jacket, the Seven J is designed to keep people dry during high-output adventures. With a hood that’s easily adjustable with one hand and an adjustable bottom cinch cord, the Seven J can be conveniently molded to best fit your body. Plus, the adjustable cuffs around the wrist help ensure rain doesn’t drip down your arms as you speed up the trail. While the Seven J is highly breathable, however, it works best as a rain jacket for light drizzles during active pursuits. Its two-layer membrane doesn’t quite cut it in heavy storms, so it’s not ideal for longer backpacking trips or places with particularly wet conditions. At 16oz, the Seven J is one of the heaviest jackets in our line up, so it’s not great for ultralight hikers. But, if you’re in need of a rain jacket for a quick lap up your favorite trail, the Seven J might be for you. The Glennaker Lake rain jacket from Columbia is a casual weekend warrior’s best friend. A simple design with a stylish in-town look, the occasional hiker might appreciate the Glennaker Lake’s ability to look stylish both on and off the trail with its hideaway hood. This rain jacket is light and relatively compact, but its major downfall is that it doesn’t have a true waterproof membrane. Made only with 100% nylon, the Glennaker Lake doesn’t have the high-tech waterproof membrane typical of true hiking rain jackets, so it’s not designed to keep you dry in a true downpour. That being said, if hiking is just an occasional activity for you, you might find that the Glennaker Lake is water resistant enough. Particularly if you live in a dry environment or only venture out on trails close to home, the Glennaker Lake might be the rain jacket you need. No two outdoor enthusiasts are alike, and nor are any two rain jackets. When purchasing a new rain jacket, there are a few factors that you ought to keep in mind before deciding on the one that’s right for you. A high-quality rain jacket can help keep you warm and dry in wet and windy conditions, so it’s a must-have piece of gear for any hike. Unfortunately, there are so many rain jackets out there today that it can be difficult to determine which one is best for you. This buyer’s guide will walk you through the ins and outs of rain jackets and will clue you in to the most important things to look for in a waterproof layer. Finally, we’ll end with reviews of some of our favorite hiking rain jackets so you can find the one that’s right for you! Imagine wearing a full rubber suit and hiking up a steep trail during a rainstorm. You’ll definitely be protected from the rain, but you’ll find that the inside of your suit is soaking wet even though not a single drop of rain ever made it to your skin. It turns out that while rubber suits are great for keeping us dry, they have effectively zero breathability, which means that when you work hard, your sweat just gets trapped inside. Breathability is one of the most important characteristics to consider when looking at rain jackets. 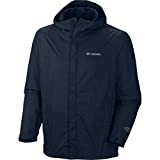 Most modern rain jackets exist on a continuum of breathability from not at all breathable to exceptionally breathable. While it might seem like a no-brainer to choose a highly breathable rain jacket over a non-breathable one, it’s important to note that breathable rain jackets tend to be significantly more expensive or less water resistant than their less breathable counterparts. Thus, people who enjoy hiking or more physical activities might prefer a more breathable rain jacket while people who enjoy car camping or less strenuous activity may find a less breathable rain jacket is adequate for their needs. High-quality rain jackets get their water resistance from a special layer embedded within their fabric that is known as a waterproof membrane. These membranes are made by a variety of companies and go by names such as Gore-Tex, eVent, and BDry, among others. Waterproof membranes allow rain jackets to keep water out while simultaneously allowing sweat to escape. These membranes vary slightly in their breathability and durability, but most outdoor enthusiasts will find that they can’t really tell the difference between the different brand names. What’s more important is to remember that these membranes can only do their job and keep you dry if they are well cared for. This means that we should wash our rain jackets frequently, to keep the membrane pores clear of dirt. Moreover, we must also frequently reapply DWR (durable water repellent) product to our jackets to ensure that rain beads off the fabric instead of clogging the pores for maximum water resistance and breathability. Many hikers and backpackers find that they just never have enough space in their pack for all their gear. Large, bulky pieces of gear making packing a pack unnecessarily difficult, so we often opt for more packable items. When it comes to a rain jacket, packability can be pretty important, especially for those of us who like to travel lightly. Generally speaking, however, highly packable rain jackets tend to be more expensive. Plus, packable rain jackets often are less durable than their less packable counterparts or tend to be less water resistant, so it really comes down to what you value in your rain jacket. While they may seem sleek, shiny, and thin, rain jackets are actually made up of a number of different layers and materials, all of which are designed to keep you dry in foul conditions. On the outside of a rain jacket, you’ll generally find a thin layer of DWR (durable water repellent), which is a chemical that causes water to bead directly off of the fabric instead of being absorbed. The DWR is applied to a fabric shell layer, which is designed to protect the waterproof membrane below. This shell layer can come in a variety of different deniers, or the thickness of the fibers in individual threads of the fabric. The thicker the fiber, the higher the denier, and the more durable the shell layer. A higher denier, however, often weighs more and is less packable than lower denier fabrics. Below the shell layer of a rain jacket is the waterproof membrane, which is then surrounded by an interior fabric liner. This interior liner is specifically designed to wick away sweat to help you stay cool. At the end of the day, you can only wear one rain jacket a the time, so it’s important that you choose the one that’s best for your needs. Out of our line up of jackets, we declare the Marmot PreCip to be our head-to-head winner. With its unique mix of value, lightweight, and thoughtful design, the Marmot PreCip is great for most day hiking adventures. Plus, it manages to combine these great features with an affordable price, which is why we feel it’s the true winner of this best rain jacket competition. That being said, the right rain jacket for you is the one that best meets your needs and demands on the trail, so when choosing a rain jacket, it’s important to consider all of the different factors at play. Happy trails!